My oldest daughter just started her sophomore year in college. The college she is going to has a great veterinary program. That’s the original reason why we did a college visit, she wanted to check out the vet program. After deciding it’s too long to be in school she chose another degree program but loves the school. She has worked for a doggy daycare for several years because she loves animals. Back when she was a sophomore in high school she was in a bit of a withdrawn phase so I suggested that we volunteer at a place called Wayside Waif’s which is an animal rescue place where you can adopt dogs and cats. We had a blast and really enjoyed the volunteer work. Now looking for volunteer ideas for my youngest daughter who is now a sophomore in high school. Seemed like a good topic to write about. 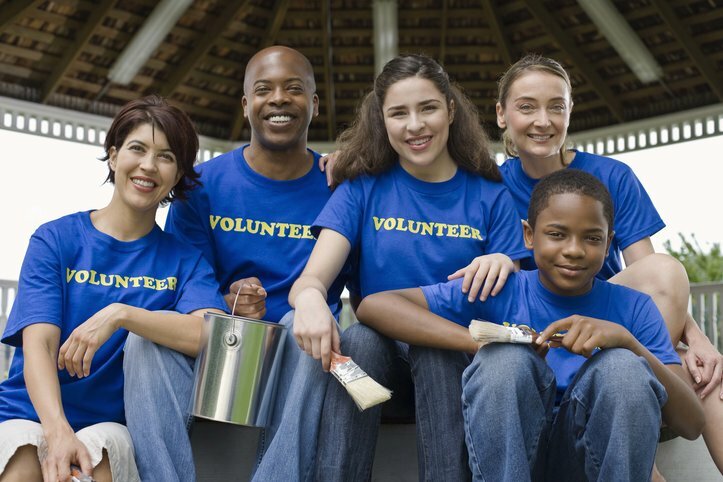 Let’s look at some volunteer ideas for teens. So it would seem fairly intuitive that when thinking about volunteer ideas for teens that you’d want to match interest to what they are going to volunteer for. As I mentioned above my oldest daughter loves animals so doing something at an animal shelter made complete sense. I volunteered with her because I wanted to and when we started she was 14. At the shelter we volunteered at you had to be 15 to do it on your own so since she was 14 a parent was needed. Worked out great. I’ll probably have more of a challenge with my youngest daughter matching interests to volunteering but we will figure it out. My daughter and my wife have volunteered at Harvesters previously. Harvesters is a regional food bank that provides food to folks in need over a several state area. It’s a great organization and when my youngest daughter did it previously she enjoyed it. This seems to be a theme I have going. Like most things in life you can put as much or as little time towards it as you’d like. It all depends on what’s important to you. I think it’s awesome when someone has volunteering as a regular part of their life. If you do then putting some time towards it once a week is great. I know some people that do it 2-3 times a week and others who do it once a month. It’s whatever you have time for as well as your personal level of comfort with it. 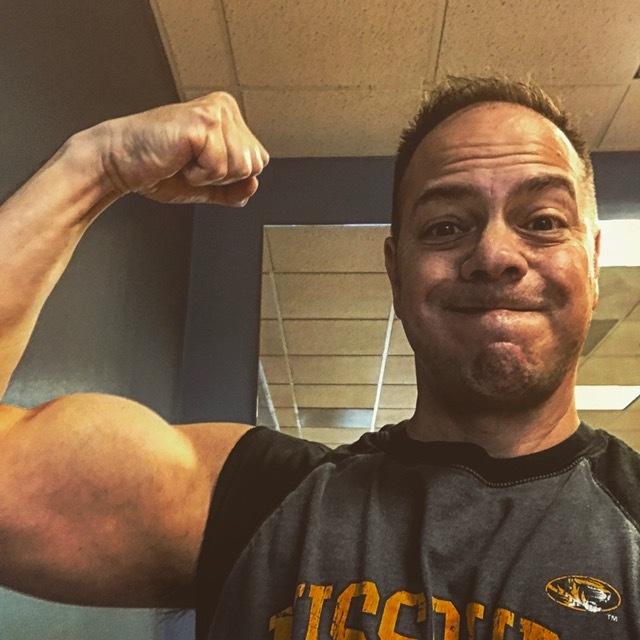 If your teen is heavily involved in sports maybe once a month or every other week is a good option. If they aren’t involved in an extra-curricular activity and don’t work it might be better for them to volunteer weekly. All depends on how much time they have available and how motivated they are to volunteer. I’m betting that almost no matter what you’ll be able to come up with some volunteer ideas for teens that will fit his or her current availability. Food bank – I mention this one because we have a great one where I live and it’s a universal need. One of the great things about the Harvesters food bank in my area is they pack “back packs” for kids who don’t have the money for a daily lunch. The “back pack” provides a full school week worth of lunches. Animal Shelter – And I mention this one because my oldest daughter loves it. There are animal shelters all over this great country of ours that are run by volunteers. This places you can work as much as you’d like. During my daughters and my time at Wayside Waif’s we usually worked once a week for 3 hours but sometimes picked up another shift. The majority of what we did was “socialize” the animals which meant we got to play with them. Red Cross – Something really cool about the Red Cross is they have an entire youth section titled Junior Red Cross. 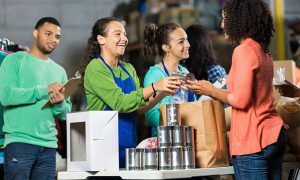 Teens can organize a blood drive, get trained and ready for disaster relief and even train younger kids on home safety. Isn’t that awesome?! Library – If your teen loves to read you might check out your local or closest library. Many times libraries have a variety of things teens can help volunteer their time at. Everything from helping check books out to organizing to cleaning. If you’ve got a reader, this one may be something to consider. Nursing Homes – Many nursing homes love to have teen volunteers. The biggest gift a teen can give at a nursing home is there time. Going on a regular basis to visit with someone means a lot. And there are no shortages of folks in nursing homes who love to chat with someone who is interested. Camps – If your teen enjoys being around younger kids they might consider volunteering at a camp. Camp counselors are typically a paid gig but many times there is an age requirement. If your teen is 15, 16, or 17 they might not be older enough to be a counselor but could be a counselor in training. Another benefit is many times they get their camp fee waived or reduced. Double bonus! Help Younger Kids With Homework – This is a fun one that comes with additional side benefits in many cases. In the school district my girls attend they have an A+ program. Once you sign up you are assigned an elementary school close to your home. You then spend 50 hours volunteering at the school and most of the time it’s to help kids with homework. Once you complete the 50 hours (plus have attendance at school of 95% and a 3.2 GPA) you are awarded $2,000 per year to attend a state college for your freshman and sophomore year. It’s like earning $8,000 for volunteering! Organize a Fundraiser – This has gained a lot of steam lately and is so much easier than it used to be. Teens that are passionate about a cause can easily set up a Go Fund Me page or I’ve seen it done through Facebook a lot these days. If you add a physical aspect to it such as a 5k walk or run it’s even better. This can be as easy or as in-depth as your teen would like. Either way it raises money for a good cause they are passionate about. Donate Toys or Clothes – I love this one for both the good it does as well as the ease of it. Once or twice a year I make a thorough run through of my clothes. Anything not worn in the last year gets donated to Goodwill. Several years ago I made my two daughters go through all of their toys with me and we donated about 80% of it to Goodwill. Your teen can do this in her own home and help others. 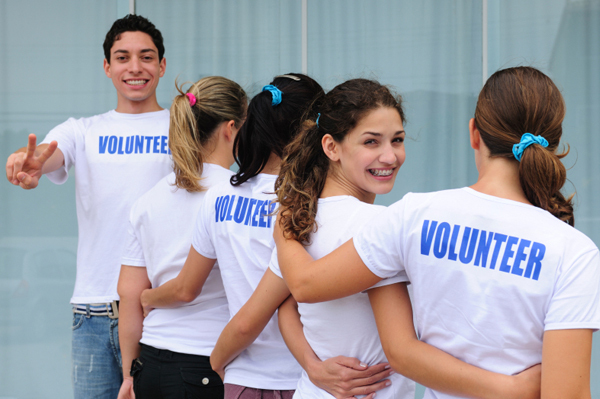 A primary benefit of volunteering for teens is the sense of helping others. The reality is many teens have a very self-centered world. And that’s not a bad thing, it’s just the way it is as a teenager. When teens volunteer and help out others it broadens their sense of the world. Volunteering helps teens see there’s a world outside of their own and they can make an impact in other peoples lives for the better. A nice side benefit is that no matter what the volunteer ideas for teens yours might choose, it will help them with their future. In many cases it can be a resume builder. When my youngest daughter was filling out her job application about 5 months ago she asked me what she should put as experience. She really didn’t have much to put outside of the sports she had played. In contrast my older daughter had several volunteer things she had done to put on her first job application. Research has also shown that teens who volunteer also benefit from higher self-esteem and resilience. Both of these are huge contributors to leading a happy life. Hopefully through this article I’ve been able to provide your with some volunteer ideas for teens. The list I’ve provided here is really just a sampling. There are many volunteer ideas for teens and there should be no problem matching one to what your teen is interested in. The benefits of volunteering are wonderful for everyone involved. Now let’s go donate some stuff! This is the superb article. I think some parents think their teens should spend most of their time studying but there are so many benefits to volunteering, especially when it is something that they enjoy doing anyway! Obviously, you have to get the balance right. Thanks for the comments, much appreciated. It’s not easy finding time for volunteering for teens when they are doing many activities but is so worth it! I enjoyed reading your article. I think it is a good idea for teens to volunteer, they get so much more out of life. When I was a teen I was in the Red Cross and my mum was in it too. I later did voluntary work in mental health. You make friends and like you say it is something to put on a job application. I live in England so we have Dogs Trust for dog shelters. They do a very good job looking after and rehoming dogs. Teens can learn how to be kind to animals. There are a few horse sanctuaries too where volunteers can gain experience, which is another useful factor of volunteering. Thanks for the note. You sound like you are definitely into volunteering! My oldest daughter and I volunteered at an animal shelter for several years. Been working with my youngest to figure something out. Thanks!